Some are taken to rescue farms or foster homes — lifelines that are also buckling under the pressure of the nation’s worst drought in half a century, which has pushed the price of grain and hay needed to feed the animals beyond the reach of many families already struggling in the tight economy. And still the drought rages on. The most recent federal assessment is that parts of at least 33 states, mostly in the West and the Midwest, are experiencing drought conditions that are severe or worse. It is affecting 87 percent of the land dedicated to growing corn, 63 percent of the land for hay and 72 percent of the land used for cattle. With water tables falling, fields are crusting and cracking, creeks are running dry. Water holes first shrink, then vanish altogether. And dozens of wildfires are consuming forests and grassland across the West. While precise figures are hard to come by, rough estimates from the Unwanted Horse Coalition, an alliance of equine organizations based in Washington, puts the number of unwanted horses — those given up on by their owners for whatever reasons — at 170,000 to 180,000 nationwide, said Ericka Caslin, the group’s director. Many more could be out there, though. 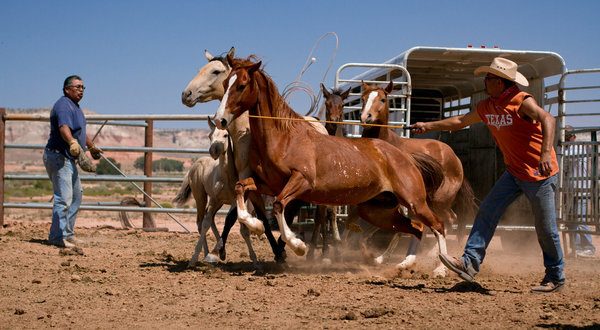 The Navajos, for instance, have no tally on the number of feral horses on their land; a $2 million effort to count and round them up was vetoed by the tribe’s president because of the cost. Here, in this speck of a city in northern New Mexico, just outside Navajo territory, Debbie Coburn has been scrambling to enlist volunteers and raise money to feed, clean and care for three times as many abandoned horses as she had in her rescue farm, Four Corners Equine Rescue, through all of last year. At $8 to $12 for a bale of roughly 60 pounds, enough to feed a riding horse for maybe three days, hay already costs five times what it did 10 years ago, Ms. Coburn said. This summer’s anemic harvest has spurred competition for a limited supply among ranchers big and small, from nearby cities and also from out of state. And as a rule, the price of hay goes up in the cold months; it doubled last winter, when the drought’s devastating effects first began to sprout. Tony Pecho, the president of Illinois Horse Rescue of Will County, some 50 miles south of Chicago, has been trying to get horses adopted straight from the homes of the people who call to say they can no longer keep them. There is no money to bring them all to his farm, he said. And while calls for abandoned horses were rare in years past, this year they are the most frequent, he said, sometimes coming from places as far as four hours away. Mr. Pecho has been asking for donations, of money as well as hay, on Facebook. On Saturday, Connie Hendrix, the president of the Missouri Forget-Me-Not Horse Rescue and Sanctuary in Linn Creek, hosted a fund-raising ice cream social and pie auction at a church, and she plans a golf tournament and silent auction next month, just to feed the horses she already has. Last week, Ms. Hendrix picked up a mare running in the woods behind a subdivision in a city 120 miles south of her facility, thirsty, malnourished and with an injured eye. Last Monday, she said, she got a call from a sheriff’s deputy asking if she could take in seven scrawny horses, three belonging to someone who is unemployed and the other four to an elderly man on disability. Neither, Ms. Hendrix said, could afford to keep the animals fed. She is not sure if she can, either. “I don’t know if we’re going to be able to find hay or afford hay to take in that many,” she said. There is little logic to the hay market. Ms. Hendrix’s rescue gets its hay from Tennessee, while the rescue in Illinois brings it in from northern Wisconsin. Jennifer Williams, the executive director of the Bluebonnet Equine Humane Society, a network of foster homes for horses in Texas, said she gets it from wherever she can. Ms. Coburn said she could still find New Mexico hay for her horses, but competition from out-of-state cattle ranchers is stiff. Big trucks that roll in empty leave packed to the brim, bound for places like Texas and Kentucky. At the Navajo reservation, where much of the once green grass is gone, leaving behind only sand, sheep herders have taken to bringing their animals to eat the scraps of hay that are left behind after bales are sold in open-air markets. Feral horses, free-roaming animals that once were domesticated, have been jumping over fences to eat the weeds that grow by the side of the road. Forage “has shriveled and died on the range,” Kimberly Johnson, the acting supervisor of the tribe’s grazing management program, said from the headquarters of the Navajo Nation’s agriculture department in Window Rock, Ariz., near the New Mexico border. Ms. Johnson said that only 30 percent of the tribe’s livestock owners care for their animals on a daily basis, based on an informal survey this year. So the horses have been searching for water wherever they can: in mills and troughs meant to supply the families that live around them, as well as the animals they own, and in lakes the drought has turned into puddles. Stallions fight one another for food and water, their bites drawing flesh and blood. Atop a mesa near Many Farms, Ariz., in the heart of Navajo territory, horses were stomping the ground one recent afternoon, as if trying to draw water from a pond that is now just cracked dirt. Tribal rangers said carcasses dot the arid landscape. Horses are sacred animals to the Navajos; they symbolize prosperity and the beauty of the Navajo way of life, Ms. Johnson said. She and her colleagues have found themselves in an awkward spot, caught between tribe members who want the feral horses away from their water and out of their land and others who would rather the horses be left alone. Roundups are being carried out almost every day, all across the reservation. The horses are sold, at least some of them destined for slaughter in Mexico. One morning in Cornfields, Ariz., on the western edge of the reservation, a woman tried to keep the feral horses from being penned in her corral, cursing and screaming at the men who had rounded them up at her grandson’s request. Ms. Johnson watched it unfold from afar.